In order to encourage creative writing in my class of grade 1s and 2s in a French Immersion school, I use the strategies described by Lucy Calkins to implement a Writer’s Workshop. The children are always working on a story. and can wrote at their own pace. Currently storyboard templates are available so they can choose to create a graphic story. My grade 2 boys love this activity and, once they have completed all other set tasks, can be seen working on their writing dossier. I love that they are so engaged in creating – even those who are not too keen on writing. I hear them correcting one another and sharing their stories. They come to me and ask me how to express something in French – and then attempt to record the sentence (in writer’s workshop correct spelling is not the important focus – writing down the idea is). I cannot help but smile at their enthusiasm and look forward to reading their creations. 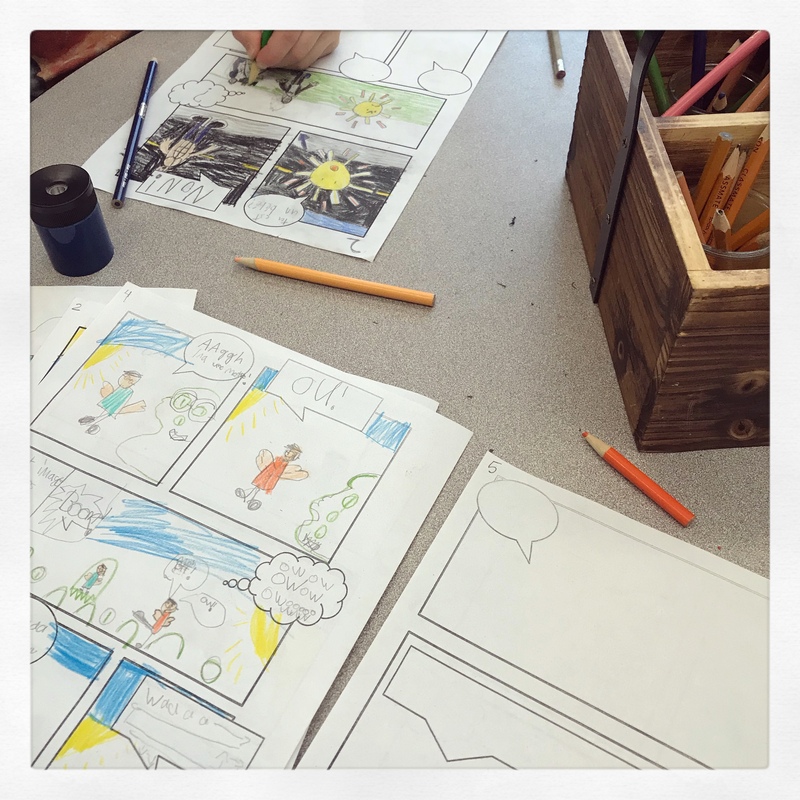 Have you tried creating a comic book? My oldest two sons loved creating comic book art when they were kids. Thanks for sharing. It is very creative and kids that age love drawing. What a great way to learn the language. Because they are interested, they write their stories even with a limited amount of vocabulary. What an excellent idea! I wish my school had done something like that. Not that I can draw, even cartoons . . .
What a brilliant idea. Like Colonialist, we also didn’t have such activity at school. Maybe if we had, I would have been better at drawing. I also didn’t have this experience at school – I fact we were discouraged from even reading comics. I would have loved activities like this when I was in school! They certainly encourage one to learn, don’t they? It certainly encourages my students to focus on a task and write.